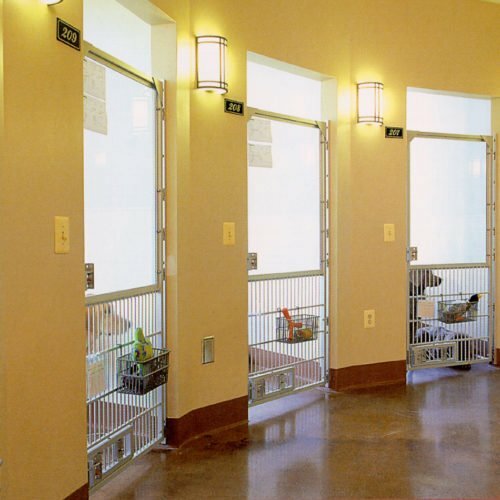 This 27,000 square-foot, two-story pet resort and spa sets a new benchmark for large-scale pet resorts. The facility includes an indoor swimming pool and exercise track, 42 executive suites for dogs, condominiums for cats, doggy day care and play rooms on each floor, a pet boutique, and a 10-station pet grooming salon. The unique wedge-shaped configuration of the plan was driven by the triangular site upon which the facility sits. This odd shaped piece of ground was a “leftover” piece that supposedly had only limited development potential. Working with the owner, we were able to turn this limitation into an exciting and successful business venture.